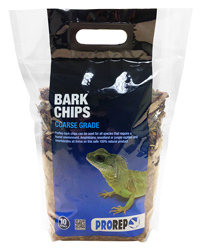 ProRep coarse grade Bark Chips are used for all species that require a humid environment. Amphibians, forest or jungle living reptiles and invertebrates all thrive on this safe 100% natural product. Directions: Spread the substrate evenly over the bottom of the enclosure to a depth of at least 2"(5cm). Bark Chips can be moistened to provide extra humidity but avoid making them too wet or waterlogged. Spot-clean daily and completely replace every two or three weeks, or more frequently if it becomes heavily soiled. If you are using an under-tank heat mat as your heat source do not use a thick layer of Bark Chips as this may cause the heat mat to over heat. Please refer to the heat mat manufacturer's instructions for more information. Nice textured, coloured chips, happy with product. Quality bark.